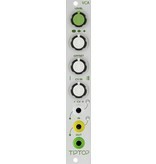 The Tiptop Audio VCA is a full featured, precision calibrated, analog Voltage Controlled Amplifier. At its heart is a novel design of a control circuitry-a function that lets you sweep continuously through three different response curves: Logarithmic, Linear, Exponential-giving you all three shapes in a single module. This special control circuitry design by Mr. Osamu Hoshuyama was adopted into the VCA module to make it a great sounding synthesizer VCA with flexibility to address all duties: level control for both audio and CV modulation, gating audio into silence, and amplitude modulation effects.